Manager Mark Hume believes his squad is getting stronger after his below strength Gladiators won an epic FA Trophy clash against Blyth Spartans last Saturday. 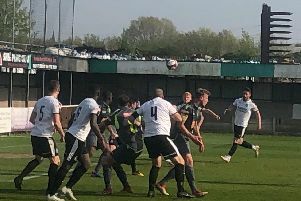 In a match labelled by many as “the best for years at the Lane”, Matlock upped their prize money from their run in the competition to £10,000 after their 4-2 victory. “It was a fantastic game, a credit to non league and it could have gone either way with all of the chances that were created,” said Hume. “It was also a battle against the elements with honest mistakes, but the pouring rain and skiddy conditions didn’t stop the great football. “We’d lost three important players, they had Robbie Dale out who’s a fantastic player, but there were things there to test us and we showed great character, especially losing Laurie so close to the kick off but Harry (Coates) did very well after being named as a substitute originally and needing five or ten minutes to get into the game. Reserve striker Jack Siddall became an instant hero, putting Matlock back in front with the vital third goal a quarter of an hour after replacing skipper Danny Holland. “Jack’s was a fantastic finish, he’s a fantastic lad who always wants to learn and will come asking you for advice. He’s had a good grounding at Scunthorpe, he knows the type of runs to make, and I now regard him as being part of our first team squad,” Hume added. Siddall’s reward was a starting place in Tuesday’s Integro Sport Doodson Cup home defeat to Daventry when two more local youngsters, reserve team players Tom Laister and Sam Lavelle had full games and Matt Wilkinson played the entire second half. Hume said: ““I wanted to have a look at them for they’ve done really well in training. It’s a big step up but none let themselves down and the talent we have at the club shows we are going in the right direction with our reserve and academy sides”. Monday’s draw for the 1st Round Proper of the FA Trophy was disappointing in so far as Matlock must travel to current Evo- Stik NPL Premier Division leaders Nantwich Town on Saturday week. Privately the Gladiators were probably hoping for a tie with one of the Conference National big boys in Tranmere, Wrexham or Lincoln City. “Yes we’d probably have liked a Tranmere or Grimsby but if we can get through this game, maybe we’ll get it in the next round,” Hume said.